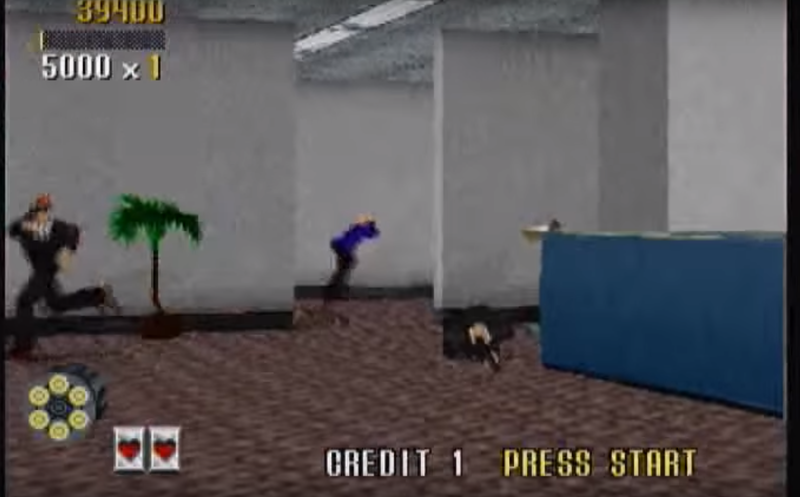 How does Virtua Cop stand up nowadays? Go read the manual, as it isn’t explained in the game, but. A detective in your department uncovers a gun smuggling ring and finds out it is linked to the E.V.L inc (subtle name) crime syndicate. The detective is murdered, and you Michael Hardy/James Cools take on the worst named bosses in gaming history Kong/the King/the Boss. Yes, worse than Metal Gear Solid! It actually looks OK. Obviously graphics are better now, but the On-Rail genre tend to be short, and with a lot of attention spent on graphics/animations. For a Sega Saturn it looks brilliant, and with the “Virtua” style graphics, it still look decent enough today. 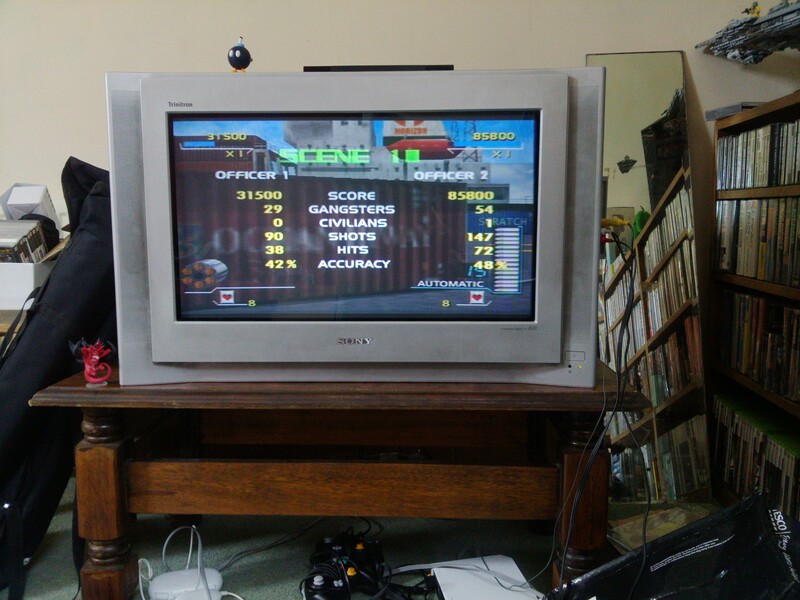 There is no difference between the Sega Saturn and the arcade (that I can remember) you get three levels, that you can do in any order, you point your light gun at the screen, and you make shooty noises with your mouth. You can use a control pad, but like any light gun game that would be a stupid thing to do. You can choose the order you do the levels, File A is Beginner, File B is the Intermediate, and File C is the Difficult. The natural way to play would be A/B/C, but I tend to go C/B/A. I do this if I am trying to get a high score. The only level I die on is File C, so i do that first, and then I’ll know if I can do the others on the life I have. I played a few times through and to be honest, it is on the easy side. You can adjust the difficulty by adjusting the amount of lives/continues, but if you have a modicum of skill you shouldn’t be needing any more than 10 lives to beat the whole game. Some twitchy autism spectrum types will do a 1 life full run though. You know who is going to attack you because they get a reticle around them, if this turns red, you’ll take a hit. On the whole, enemies are easy to hit and sensibly placed, but there are several who are either off-screen, or just appear to make you take cheap hits. 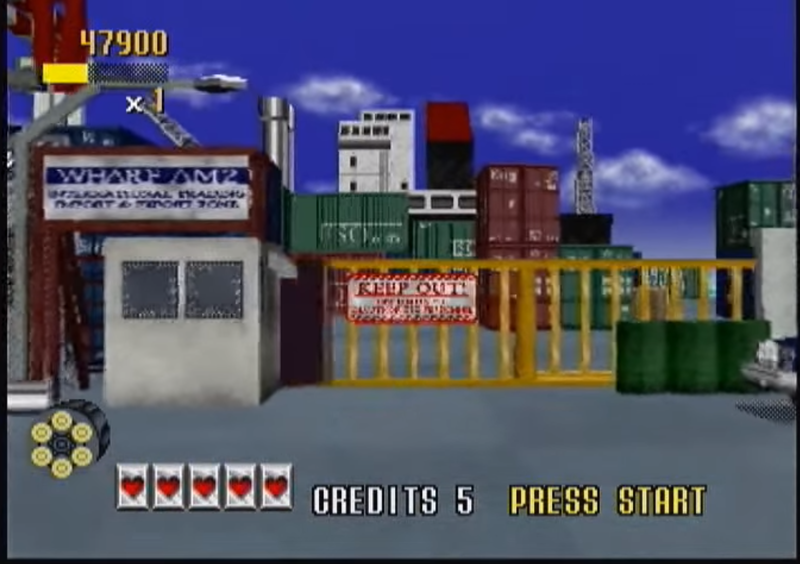 This was a standard arcade feature to eat your coins, but I’ll always complain about it in a home port. You can learn the enemy patterns, but on a first play it does feel a little unfair that somebody off screen will hit you the second the screen starts moving and you can see a pixel of their elbow. The game can also feel a little unfair when enemies daisy-chain attacks together, there aren’t many places where this is possible, but when it does happen you can quickly burn through 3-4 lives in a second. The easiest thing in the games are the bosses, they all shoot slow moving projectiles at you, so again, unless you are incompetent you’ll probably piss the bosses. So the only real difficulty comes from cheap hits (or hitting the telegraphed civilians). The only other difficulty is getting a high score. To do this, you need to get “Judgement Shots” these are sort of headshots, but it is more to do with where the middle of the crosshairs is. It is a little difficult to get used too. 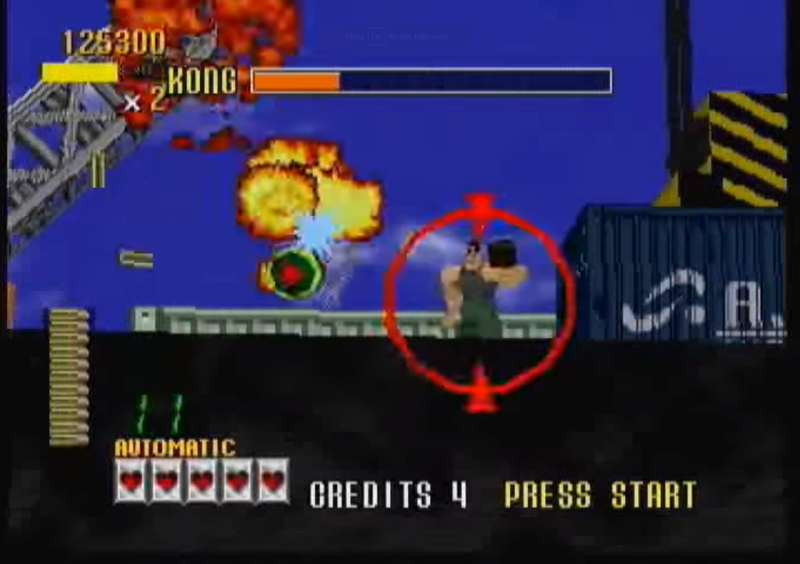 When you shoot somebody a combo meter fills up at the top, if it fills, you’ll get x2, if it fills again x3 and so on. Take a hit, and it’ll drop back to x1, it doesn’t add anything except contributing to a higher score. Like this review, the game is very short. I completed it in 30 minutes first time through. Because it is on-rails no matter how good you are, you’ll be doing it in around 30 minutes too. There is not much replayability unless you want to get high scores, but in short bursts you’ll have fun. For extra fun I played in two-player mode on my own. For a short 30 minutes of my life I got to pretend I was RoboCop. Yes I’m sad, but pretending to be RoboCop is awesome! The game is decent enough for what it is, and is slightly better than similar games at the time (such as Time Crisis and Area 51). 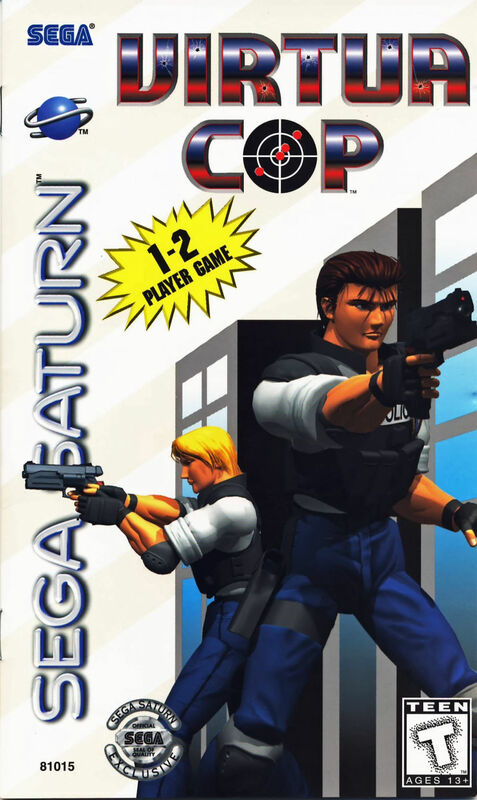 Finally, for a cheaper easier way to play Virtua Cop you can get VC1 and 2 bundled together on the Virtua Cop: Elite Edition, it doesn’t add anything except a picture gallery. After beating this; do you feel more or less like a COP?! More like a RoboCop, less like a real one. Not sure real cops are allowed to walk up to a dock and shot 73 people. *Robocop voice* YOUR MOVE….CREEP! Lol! If they were all pointing guns at him they can. Diplomatic immunity or NOT!! Was that originally from Smash TV or The Running Man? Originally it is from RoboCop, but it is a random bloke on TV. I think Smash TV say something similar.